Update (7/7/15, 12:00 P.M.): The Wisconsin Retirement System change was taken out of today’s vote on the Wisconsin budget. The Wisconsin Joint Finance Committee has inserted an anonymous #999 stealth provision (27a p. 9) into the Wisconsin State Budget that drastically changes the way in which our Wisconsin Retirement System is governed. Below is a screenshot of the specific provision. Highlighted is the main concern. 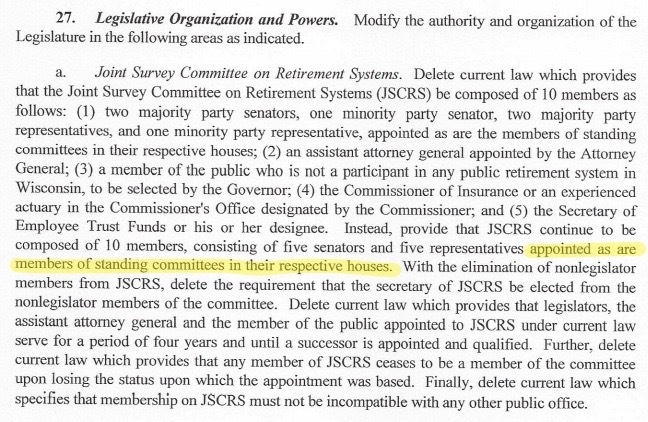 What this means: Instead of having representation from both parties on this committee that oversees our retirement system, whoever is in power at the state level, Republicans or Democrats, will have total control over how the system is run. This is not good. Kathleen Marsh states that Wisconsin public employees have one of the best pension systems in the world. This is true. According to Pew Research, the Wisconsin Retirement System (WRS) is fully funded to meet all of their obligations (Source: http://www.pewtrusts.org/en/research-and-analysis/reports/0001/01/01/the-widening-gap-update). No other state has this level of success; many are facing budget problems. In fact, Governor Walker touted this success as an accomplishment back in 2013 (Source: http://www.politifact.com/wisconsin/statements/2013/jan/06/scott-walker/walker-says-wisconsins-pension-system-only-one-cou/). That is the big question. Find out by calling your local legislators today (I’ve already started). Click here to find their contact information. According to Kathleen Marsh, they plan on voting on this as early as tomorrow. Also, share this post with other Wisconsinites who would be affected by this unnecessary change. I have no idea how your retirement system is funded or structured, but beware. Oregon had a great retirement system up, which ultimately was built on a house of cards. When it collapsed a few years ago, many people were hurt. If Wisconsin has something that is not sustainable in the long run, you may be in the same situation as Oregon was. Myra, if you follow the Pew Research link, they have confirmed that the Wisconsin Retirement System is very sound financially. They can currently meet 100% of their obligations. I read there is a $35 million unfunded liability looming. True? If so plan to fix it! Not that I am aware of – what/who is your source? I think Pew Research and MS Journal have their numbers right (follow links in post). Glad to see the legislators took this out of the budget vote today!